The Advanced tab is part of the customization panel which is available for your convenience. It is located in the right sidebar when you are in your form Settings or a View. Please note that some of these features are not included in the lite version. The Advanced tab contains a variety of clickable buttons that insert helpful shortcodes. A Customization panel is located in the right sidebar when you are in your form Settings or a View. The Advanced section contains the following shortcodes which can be used to show a saved value, show a field label, remove automatically added paragraph tags, truncate text, format dates or numbers, etc. Specify the separator for checkbox field values. By default, this will be a comma. Change the format of a displayed date. This can be used with date field, created_at, and updated_at shortcodes. For more information and options on date format, visit the Date format options section. Show the label of a field. 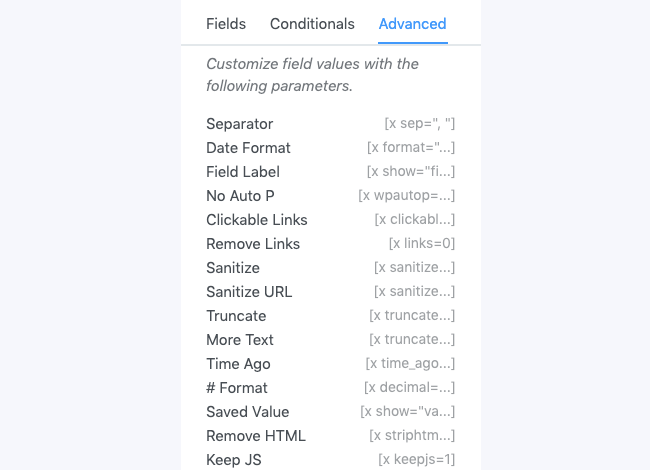 Shows the description of a field or the content of an HTML field. Remove any automatically added paragraph tags from a paragraph or rich text field. Remove a link from text. Replace spaces with dashes and change all characters to lowercase. This is recommended when using a field value as an HTML class or ID. Replace all HTML entities with a URL safe string. Use this when passing the field value in a URL. Truncate text to the specified number of characters. By default, a link is appended to the end of the text. You can use the following parameters to modify or remove this link. More Text: By default, this link will be "..." but can be changed with the parameter below. If using a Dynamic View, the link goes to the detail page. Otherwise, it will show in-place. No Link: By default, when truncating text, there will be a link to show the remaining text. To remove this link, use the following shortcode. Please note, the no_link parameter requires the truncate parameter to also be used. Change the format of a displayed number. You can change the number of decimals places, the decimal type, and the separator for thousands. For more information on this, see the Number format option section. Show the saved value of a field. This is most helpful when you are using separate values. Remove any HTML from a field. If you would like to show an iframe, this would require extra code since it works differently in WordPress from other HTML. Display an uploaded image file. Display the attachment ID of an uploaded file. Display the filename of an uploaded file. Note: In all usage examples, you must replace x with the ID of a field in your form. All of the UserID shortcodes can be found in the bottom section of the Advanced tab in the right sidebar. You must have a UserID field in your form in order to use any of the following shortcodes. User ID: Display the user's ID number. First Name: Display the user's first name. Last Name: Display the user's last name. Display Name: Show the user's display name. User Login: Display the user's username/login. Email: Show the user's email address. Avatar: Display the user's avatar, if he/she has one. Before the avatar will show, you'll need to go to the WordPress Settings -> Discussion page and make sure the "Show Avatars" box is checked. User Meta: Display any user meta you have added with the User Registration addon. You must replace "address" with the name of your user meta. Note: In all usage examples, you must replace x with the ID of the UserID field in your form. You can use the following shortcodes to display information from a dynamic field. Creation Date: Display the creation date for the linked entry. Field from Entry: Display a field from the linked entry. Replace 311 with the ID of any field in the linked form. Entry ID: Display the ID of the linked entry. User ID Information: Show information from the profile of the user who submitted the linked entry, this include user meta. Replace y with the ID of a userID field in the linked form. All of the different user info shortcode options are listed in the Insert User Information section. Replace y with the ID of the Dynamic field in the linked form. Note: In all usage examples, you must replace x with the ID of the Dynamic field in your form. Replace x with the field ID/Key of a checkbox field in your form. If you are passing a field value in your form's redirect URL and you need to prevent special characters (like accents) from being removed, follow the directions below. Go into edit the form that will be passing the field value in the redirect URL. Go into the form's Settings. Replace x with a field ID/Key. If you would like to display a user's age in a View, email notification, or confirmation message, follow the steps below. Add a Date field to your form. Title it 'Date of Birth'. Go into your View and/or form Settings. Replace x with the field ID/Key of the Date field from your form. Replace x with a Paragraph field ID/Key from your form. Replace x with the Date field ID/Key from your form. Find a full list of date format characters at php.net under the 'Parameters' section. For a list of helpful format options, scroll down to the Examples section. Change the format of a displayed number in a View, post, email notification, or confirmation message. Replace x with the Number field ID/Key from your form. decimal: Determine how many decimal places to show. Usage: [x decimal="2"].